After reading alot about CNC retrofit on the internet I decided to convert my Proxxon FF400 and my Proxxon PD400 to CNC. I bought some motors from ebay (Oriental Motor Vexta PK268-02A) and four G201 Geckodrives. Everything connects to a computer using a breakout-board with opto isolated inputs and outputs. The computer controlling the system is an IBM Intellistation runnig Windows XP and Mach3. I did also build a 50V 20A powersupply to supply the geckos and motors with unregulated power. 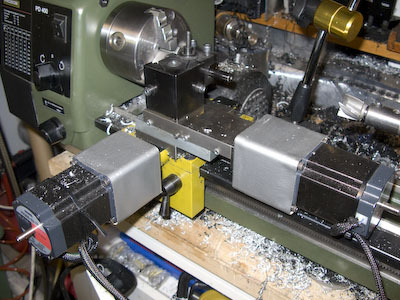 I use the same kind of motors to both the mill and lathe so I just change cables when I switch machine. I also put a motor on my rotary-table. 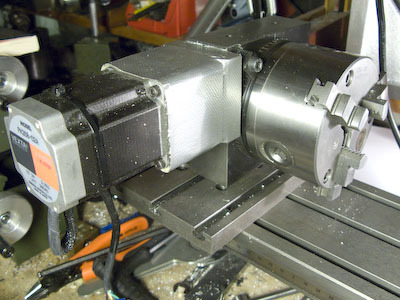 One of the stepper motors connected to the FF400 x-axis. The hand wheel was removed and my first intention was to attach the hand wheel to the stepper motor but I have never needed it so it will never be done. This is the rotary table and with help of the stepper motor and Mach3, indexing is very easy. The rotary table is not backlash free so machining at the same time as the table rotates is not recommended. Here is the lathe. 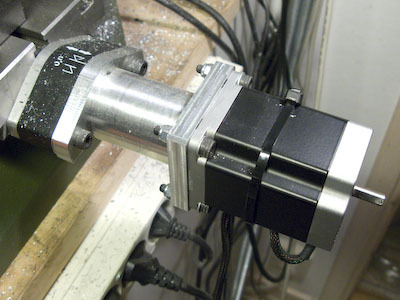 The stepper motors are mounted on the x-axis and the z-axis. The relative small travel of the Z-axis limits the length of the work piece. I have been thinking of attaching a stepper motor to the long lead screw. 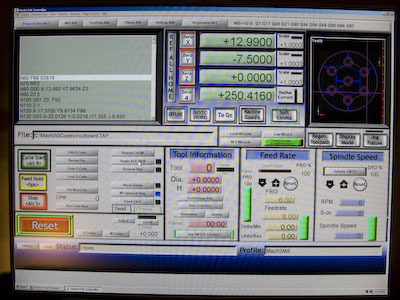 A picture of the software used to run my mill.